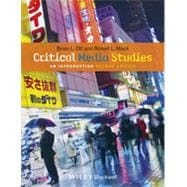 by Ott, Brian L.; Mack, Robert L.
Fully revised to reflect today’s media environment, this new edition of Critical Media Studies offers students a comprehensive introduction to the field and demonstrates how to think critically about the power and influence of media in our daily lives. Brian L. Ott is Associate Professor of Media and Rhetorical Studies in the Department of Communication at the University of Colorado Denver. He is the author of The Small Screen: How Television Equips Us to Live in the Information Age (2007), and co-editor of It's Not TV: Watching HBO in the Post-Television Era (2008) and Places of Public Memory: The Rhetoric of Museums and Memorials (2010).